Improve your cleaning routine by using essential oils in simple, natural homemade cleaning products that are easy to customize! 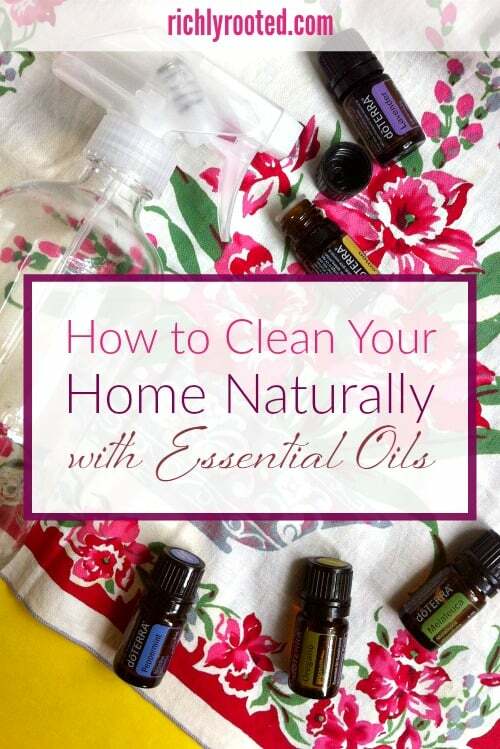 Here’s everything you need to know to clean your home naturally with essential oils. This post is sponsored by Oils by Katelyn. Katelyn is wonderful to work with and has taught me so much about essential oils! I’m glad to pass on to you what I’ve learned! When I initially switched to natural cleaning supplies, I was uber minimalist in my approach. I got rid of the toxic toilet bowl cleaners and the fake fragrance all-purpose sprays and instead used…basically nothing. White vinegar. Baking Soda. Castile soap. A few good tools. There wasn’t much in my simple cleaning caddy, but I got the job done. While these cleaning staples still serve me well six years later, I’ve gradually amped them up a bit. For one thing, having a baby presents all kinds of new messy situations, and you need a little (or a lot) of extra cleaning and disinfectant power! And although I don’t mind the smell of vinegar, I’ve also discovered that pretty scents help motivate me to clean. Why Clean Your Home with Essential Oils? Many conventional cleaning products contain chemicals that are harsh for your skin, respiratory system, and the environment (both in production and when they get washed down the drain as you clean). DoTERRA essential oils (the oils I use) are sustainably produced and much safer to use–especially when you have young children in your care! Essential oils are effective at killing germs and cutting grease, but they aren’t harsh. When you’re using essential oils you don’t have to worry about whether or not your products mix while you clean. There aren’t any deadly combinations of essential oils like you get with, say, bleach and ammonia! When you skip the cleaning aisle in the grocery store, you’ll also save money. Essential oils are highly concentrated, so a small bottle goes a long way. You only need to add a few drops to your homemade cleaning solutions to get results. Is there a scent you love, like spicy fir or juicy grapefruit? Use the essential oil in your cleaning routine and you’ll find the experience much more enjoyable! 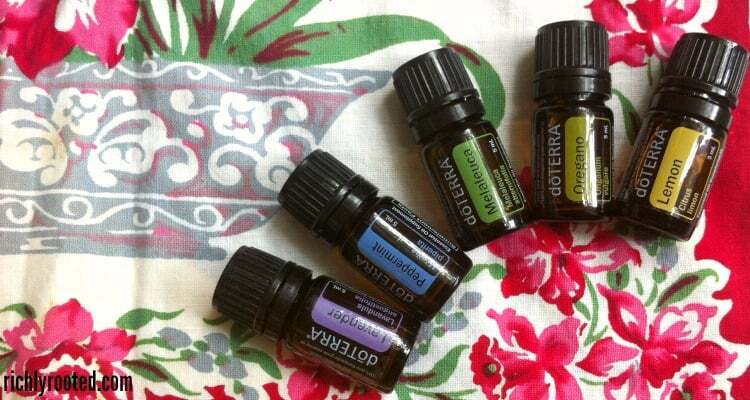 You can rotate out essential oils for the season, using clove at Christmastime or lemongrass in the summer. If you suffer from headaches or seasonal allergies, add lavender to your cleaning bottle and breathe in deeply while you work. Is someone in your house battling a cold? Try cleaning with peppermint or eucalyptus–you can clean and relieve congestion at the same time! Using essential oils lets you tailor your cleaning recipes to suit your preferences, support your family’s health, and avoid toxic chemicals–all while saving you money. Lots of wins there! 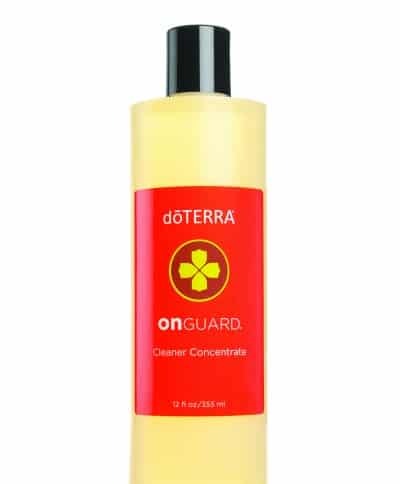 The OnGuard concentrate that doTERRA sells also makes an excellent all-purpose cleaner. The concentrate contains plant-based surfactants, rather than chemical, and has a blend of orange, clove, cinnamon, eucalyptus, and rosemary essential oils. The spices make it smell a bit like Christmas. It’s lovely! Where to buy: You can purchase all of the oils mentioned in this post via Katelyn’s website. The most cost-effective option is to get a wholesale membership (you pay a small yearly fee to get the discounted prices). You can also get FREE samples of some of Katelyn’s favourite essential oils HERE. 1 Tablespoon OnGuard Concentrate in a 16-oz spray bottle of water. Use to clean doorknobs, bathrooms, counters, and kitchen appliances (but be careful not to spray/rub on the painted lettering, as that might wipe it off). 1 Tablespoon OnGuard Concentrate in 1 gallon water. 5 drops essential oil(s) of choice plus 8 ounces water. Lime, peppermint, and melaleuca (tea tree)* all work well! Mix all ingredients and store in a mason jar. It will have a slightly liquid consistency. To use, scoop out desired amount and spread around tub with a sponge. Circle the tub again with the sponge to wipe and scrub if needed, then rinse. Mix all ingredients well. Makes about 2 liters. 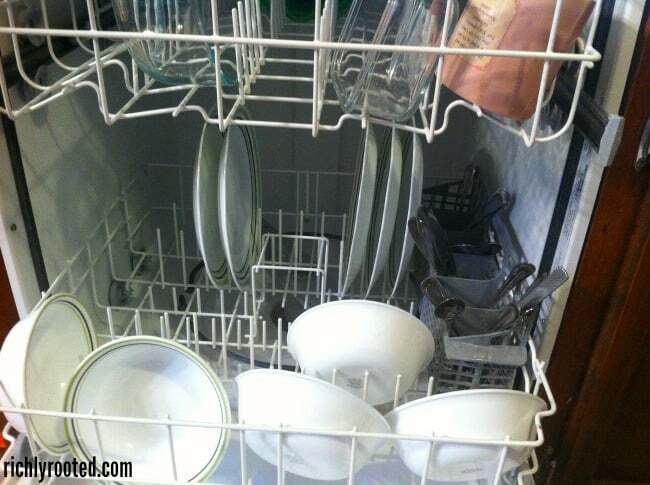 You can experiment with your dishwasher, but try using 2 Tablespoons powder per load. I’m excited for you to discover, as I have, that using essential oils simplifies your cleaning…and makes it more fun! If you don’t want to spend money on toxic chemicals and synthetic fragrances–but you also don’t want to use plain vinegar for everything–enjoy the creativity of incorporating essential oils into your routine. Do you clean with essential oils? What’s your favourite DIY cleaner recipe? *If you’re a cat or dog owner, I would avoid using tea tree for cleaning. Although you’ll be using it heavily diluted, I would personally err on the side of caution, since it can be toxic for pets. Always store your essential oils in a place that children–and your smart cat–can’t access. This post is sponsored by Oils by Katelyn. Katelyn is wonderful to work with and has taught me so much about essential oils! I’m glad to pass on to you what I’ve learned! This post is not intended as medical advice. Please talk to your healthcare providers before making medical decisions. Also, do you know of any essential oil recipes to kill mould? We get bad mould in the bathroom (gotta love the tropics!) and yesterday I had watering eyes, runny nose and a bad headache from using conventional mould killer spray – which I would obviously rather avoid! Any ideas would be greatly appreciated! I’ve used tea tree very locally, when the cat was not around. If there was a particular area I’m trying to sanitize, I might use a little mixture of the oil. But I don’t like to regularly spray it around my tables and counters and such, just in case. That sounds like a scary reaction to the mold spray! Let me ask Katelyn how to best tackle the mold. I know oregano, rosemary–and yes, tea tree–all help fight mold! Thank you for the reply! I look forward to using something different to get rid of the mould! Kateyln said that you can clean the area with Thyme or doTERRA’s Purify blend. You can also diffuse these to purify the air and keep mold at bay. Here is Katelyn’s shop link if you need anything! I lived in Costa Rica for a year, and mold was definitely a downside. Good luck! Thyme may also keep roaches away, if you have problems with those (we certainly did in CR! Ugh!). Amazing!! Nice recipes for essential oils to keep the house clean. This is really good.